I'm always seeking that which hidden in plain sight. In Vermont, there are so many opportunities to discover new places to enjoy, and for those of us that have been here a long time, it can be a revelation to visit somewhere you haven't been in the while. I recently made a trip to Burlington, Vermont's North Beach for a fall day by the water and took a revealing nature walk in Shelburne, Vermont under the light of a full moon by the upper La Platte River. 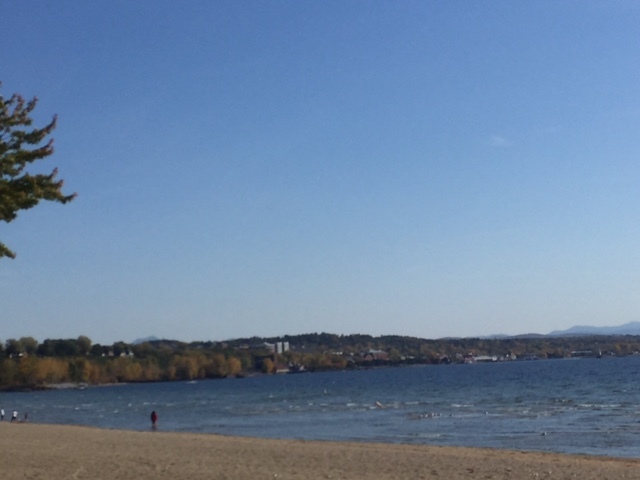 Burlington's North Beach is an integral part of Burlington's Geography. Accessible by car from North Ave just past Burlington High School and accessible by bike and foot via Burlington's renowned Bike Path. In my life, North Beach has been a respite on hot days, the early site of the Vermont Reggae Fest, an important landmark while running the Vermont City Marathon. I recently visited North Beach with my family for the first time in years. Since it was off season we parked at Burlington High School and strolled through the campgrounds. We were taken aback by the number of campsites and facilities available for RVs. We joined up with a newly refinished part of the bike path where we saw loads of bikers still enjoying the amazing resource well into the year. As you get closer to the beach you cross through a pedestrian tunnel made of corrugated metal that takes you under the bike path. This is a fantastic spot to test out your yodeling skills with any 4-year-olds in your life. We took a stroll on the beach, admired the remaining foliage and incredible views of the Adirondack mountains and took advantage of a world-class playground. This is a great spot for a stroll with the family at any time of year and in the fall you feel as though you have the place to yourself. This past weekend, I was fortunate enough to participate in a Nature Walk guided by Duncan Murdoch of Nature Connection Guide. His organization provides guided walks through beautiful areas in Vermont influenced by a Nature Based Mindfulness tradition practiced in Japan known as Shinrin-Yoku. The walk I participated in tool place in the Upper La Platte River Natural Area, managed by the Lake Champlain Land Trust. This lovely area has undergone a restoration project involving the planting of many new trees and efforts to protect rare species in this important watershed. During the nature walk, we were encouraged to immerse ourselves in our surroundings by taking time to listen to the river, take in the sights of the forest under moonlight and experience the moon from an open pasture. At the end of the evening our guide prepared a delicious and warming cup of tea made from foraged white pine needles from the surrounding forest, This guided walk provided a truly nourishing way to experience nature in a world that is often difficult to disconnect from.